Everybody who uses candles at home knows that soot formation, i.e. graphite precipitation, can be a problem. On the other hand, soot is industrially produced for usage as reinforcement in rubber or as black pigment. Soot forms due to oxygen-deficient combustion conditions. The combustion process is simulated using the system C-N-O. While the chemical system itself is very simple, it provides a good basis for demonstration. Attention will be paid to the conditions leading to the formation of condensed graphite as approximation for soot formation. 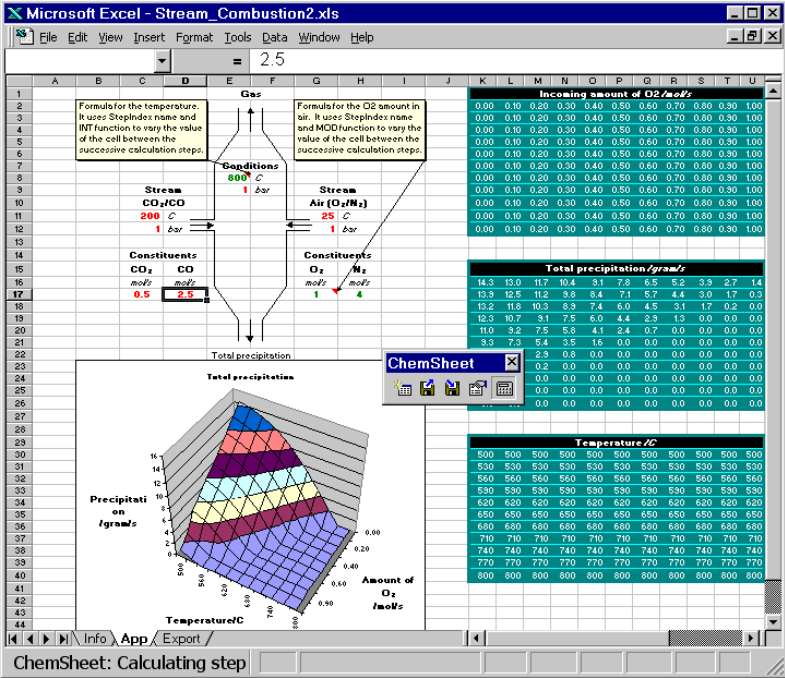 This example is distributed with ChemSheet as xls-file. In the Excel sheet the basic thermochemical process is shown: There are two input streams, the left consists of a mixture of CO2and CO while the right consists of air, resulting in a fixed nitrogen-to-oxygen ratio of 4. Each stream is defined with respect to temperature and pressure. After setting the amount of the stream consituents as well as their temperature and pressure (values in red), temperature and amount of air are varied (values in green). The results are written in the tables on the right and the amount of graphite precipitation is shown below in the graph as function of temperature and amount of oxygen used. Interested in the ChemSheet model behind this application? Take a look at how easy it is to set up the model! If you want to see how heat transfer models can be connected to this ChemSheet combustion model, please have a look at Linking Combustion and Heat Transfer.